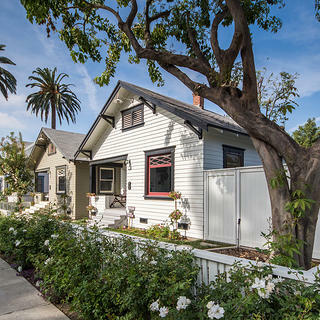 Hugh Siler has been making waves with his innovative restorations of homes in the Old Towne Historic District of Orange, California. Old Towne’s historic vibe is unique in Orange County. Working with a variety of artists and artisans, Hugh infuses these small cottages and homes with an undeniable cool-factor, and rents them out to ecstatic tenants. So, tell me what you’ve been up to in Orange? Over the past seven years we’ve restored ten houses in Old Towne Orange, and a few dozen throughout Orange County. My take is probably different from just about everybody else. We don’t just take the houses back to period correctness, but we are trying to create some of the coolest, most retro, historically accurate homes on the West Coast and making them available for people to rent. It’s been incredible. There are still people out there who appreciate quality, especially when you’re giving it to them at a fair price. 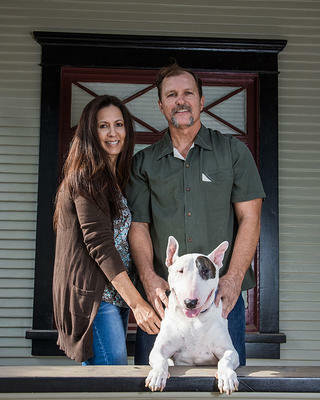 Hugh with his girlfriend and local business owner Christina Martinez, and their rescued Bull Terrier, T-Bone. In 2016 we acquired block of five homes across two parcels, ranging in age from 1904 to 1920. We are about to have the fourth out of five completed by the end of next month. The rest of 2018 will be dedicated to the fifth and final home. These homes include two 1200- to 1400-square-foot hipped roof cottages, and three smaller cottages from 330 to 475 square feet. These last ones were the original tiny homes that are trending today. 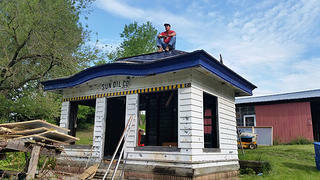 I’m also in the process of working with an architectural firm with the goal of re-purposing a former 1920s Sunoco gas station attendant’s office into a historical shed on the property. The idea came about as a way to pay respect to Lloyd Long, who along with his wife, Edith, owned three of the homes we have restored. Mr. Long also owned and operated the gas station in Old Towne, so I thought it only fitting to find an old attendant’s office, which is a simple 10-by-16-foot structure, and see what the city and community thought about re-using this small structure as a non-permanent shed since none of the five homes on the block has a garage for storage. What inspired you to add these personal touches, and really quirky artistic details? It's all part of the process when you're working with these unique homes– it's all rooted in authenticity. With the smaller cottages you can add these whimsical touches and not take it too seriously, when you're living in 450 square feet and people appreciate this character and personality. I like to integrate the art into the walls that have been there 100, 110 years. It just naturally happens when you're working with like-minded artisans and craftsmen. Yesterday, for example, I brought a sign painter in from Reno, Nevada, to paint a piece of glass on the pantry door in the kitchen. After doing some research we found the oldest bakery in town was built in 1911 just 200 yards from the home. I got ahold of the family, and from early pictures we were able to replicate the logo from the early 1900s and it's now on the pantry door. The family was so excited. The 92-year-old matriarch of the family was ecstatic. T-Bone featured in the backsplash of one of the homes. 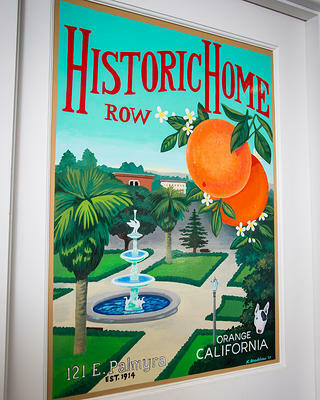 Custom door art in the style of a vintage travel poster promoting "Historic Home Row" with T-Bone's stamp of approval at the bottom right corner. 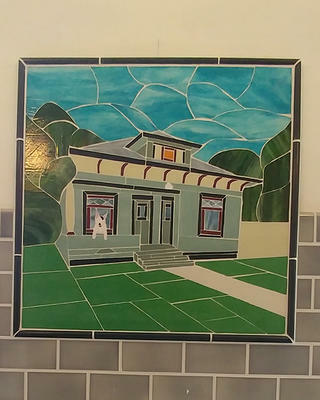 What drew you to preservation and historic homes? I would say growing up my dad always restored old motorcycles and cars, so I would watch him meticulously restore these old hot rods and motorcycles. I wasn't the type of guy who liked to get greasy, it wasn't really me. 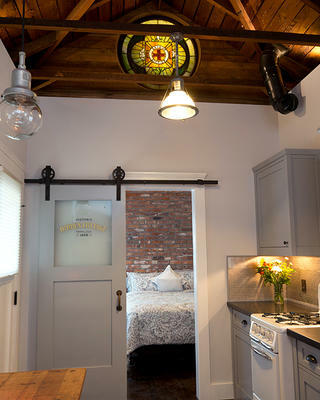 But you'll see a lot of mechanical history in these homes… lights out of commercial buildings and parts of 1880s trains... Back in the day trains were really elegant, and their fixtures were adapted for a small spaces, so they adapt perfectly for these little cottages. One light is from a former dentist office, one of the first dentist lights from about 1900. 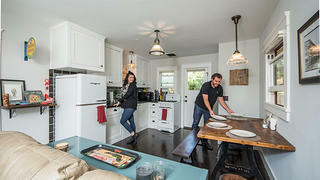 Tenants Ryan and Bree cooking in their cottage. 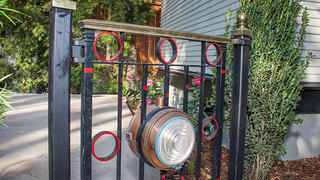 Railroad elements incorporated into a cast iron gate. Hugh atop the Sunoco attendants lodge he hopes to restore. An interior view of one of the cottages. How has the community received your work? I truly believe Old Towne Orange for a number of years was what I would call an unpolished nugget. Over the last few years there's been this amazing comeback, and people are suddenly really invested in historic homes and local businesses and restaurants. Chapman College has also purchased a number of historic buildings and restored them. The first project we did here won a Preservation Award for historical accuracy from the Old Towne Preservation Association. Fast forward to last May, the two cottages we finished won the association’s "Sweet Sweet Orange Award" for historical accuracy and preservation. This was the first time rental homes won the award, and we were competing with grand Victorian homes. To me it's the ultimate compliment, that these houses that haven't been loved for the last 70 years are in some ways surpassing grand Victorian manor houses. In November 2017, I was asked by the Old Towne Preservation Association to do home tours. Typically five homes are selected every other year, and they selected three of our cottages. The tenants were super into it, and each chose to lead people through their homes for 1,500 people over two days. They gave the tours and told the histories of their own home. How do you find the balance between livable, modern amenities and historical accuracy and character? That is probably the most difficult challenge. People can find newer homes with dual-pane windows and granite counter tops, that's not hard to find here. In a historic home there are a lot of good things, but your windows are going to creak a little bit, and they may not close as tightly as you would like. There are 115-year-old Douglas Fir floors that if you wear high heels it'll leave dents. I try to educate people on how these homes should be treated and lived in, and for the most part they really respect it and quickly get used to it. Most people who choose to live in a historic house want to live in and experience it respectfully.